A further investigation found that Lockheed Astrophysicists analyzing the link between solar particle streams and grid disruptions discovered a 25% higher increase in disruptions during and after solar storms > Kp=5.22. Note that in the left hand box, when the Kp Index is > or = 5.22, there is almost immediately a 25% increase in grid related disturbances. As I mentioned, the surprisingly high stream from the coronal hole hit at Kp 7.0 and the power went out within an hour. Coincidence? Perhaps, but I think not. First, Tamitha Skov, an Aerospace Corp physicist using NASA data, predicted on August 23rd a major solar storm potentially hitting Earth on August 25th through 26th. Second, a strong disturbance was also detected in Norway at around the same time as the Dodger game blackout. Anyway, the Dodgers got their mojo on just after the lights came back on and completed a freaky run by Justin Turner, winning the rather lengthy game by 5-4. Whether or not the local utility gets their mojo on and retrofits their circuits to better withstand ground currents remains to be seen. Saturday 25 Aug 2018 Dodgers vs Padres as described above. Monday 31 July 2018 Dodgers vs Brewers power outage due to Mylar balloon. I trust the utilities to understand what would happen to the grid during a Carrington event. Do they? The geomagnetic storm causing this event was itself the result of an ejection known as a coronal mass ejection on March 9, 1989. A few days before, on March 6, a very large X15-class solar flare also occurred. Three-and-a-half days later, at 2:44 am EST on March 13, a severe geomagnetic storm struck Earth. The storm began on Earth with extremely intense auroras at the poles. The aurora could be seen as far south as Texas and Florida. That was just over a week before the spring equinox. Equinoxes are known to be the most active time of the year for another magnetic phenomenon: auroras. I DON’T trust that the local utilities are prepared for a Carrington level event. After several large power outages in 2017, I shot off a few emails to the local utility, LADWP, hoping to alert them that solar storm damage to the grid can be prevented. I didn’t get a response from their engineers in 2017 and I haven’t gotten one from them in 2018, only from their public relations person. Since L.A.D.W.P had expensive power outages on April 21st (at LAX) and July 8th (Northridge), both days that had ionosphere shockwaves with >5 Kp index, they might want to know in advance when similar conditions exist. I started researching how utilities can mitigate transformer thermal overloads. It turns out that there are mechanisms that they can employ. You have to know you have a problem before you can solve it. Slide #25 indicates that there are possibly some mitigation techniques that can be employed, such as GIC blocking devices. “It is possible to detect the occurrence of a GIC and implement mitigation strategies to prevent potential disruption to the power system. 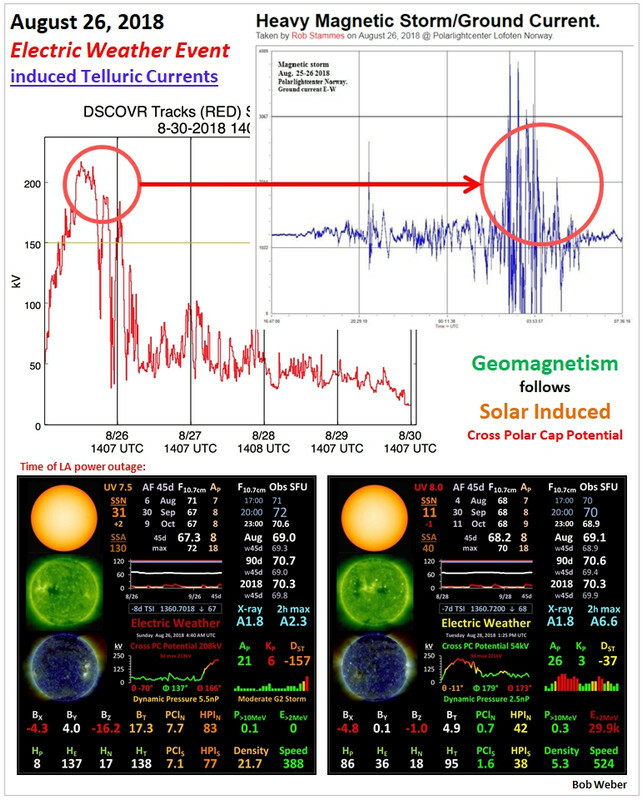 One approach is to use indirect measurements of geomagnetic effects. The U.S. Geological Survey (USGS) provides close to real-time measurements of the earth’s magnetic field strength at 100 worldwide locations, and the National Oceanic and Atmospheric Administration (NOAA) provides average magnetic field strength taken from one location (Boulder, Colorado). The other approach is to use direct measurements based on measuring dc offset and harmonic content of transformer currents. SEL relays provide the capability to filter, measure, and detect the effects of GIC through measurements of dc offset and harmonic content. For some protection schemes, the ability to filter the harmonic content allows the relay to perform the protection function with no impact during a GIC event. SEL’s recommended approach is to use a combination of direct and indirect methods to implement a wide-area mitigation scheme. During a known solar storm and when the harmonics become excessive, the operator can select a response based on the characteristics and operating environment of the power system. GIC is more of an issue for heavily loaded transformers. If there are susceptible transformers that cannot be replaced by more reliable designs, then these transformers should have their loading reduced during a storm, or even in anticipation of a storm. Maybe the local utility, LADWP, is aware of when solar storms are coming, maybe they’re not. It can’t hurt to find out what they know and alert them of possible solutions. They will contact me only if they’re curious. The solar storm of 1859 (also known as the Carrington Event) was a powerful geomagnetic solar storm during solar cycle 10 (1855–1867). A solar coronal mass ejection (CME) hit Earth’s magnetosphere and induced one of the largest geomagnetic storms on record, September 1–2, 1859. That was 3 weeks before autumn equinox (see comment above). Happy 159th Anniversary Carrington event. I just noticed that the incredibly large Carrington CME hit the Earth on September 1st and 2nd, 1859, so EXACTLY 159 years ago. Seems like a good day to post about CMEs. Re Greg’s question: All three phase aerial transmission lines are earthed at the star point via a robust reactor. That is because lightning strikes can inject a very high current, sometimes enough to cook to a cinder the reactor and its series resistor (experienced that twice). In no instance did it trip the generators. However there are other protective devices on generators that can be induced to respond, even on small currents that should not be there. But the fact that the trip was not widespread, it is more likely that the trip was due to a local station fault. The sources can be many in number, like elect leakage due to dampness, dry connections, failed electronics, and frequently cats and mice. Nice catch Greg. It was a great storm to witness as it happened. The EW app images will be live soon. “The city utility says electrical wires can be melted when metallic balloons come in contact with power lines, causing fires, property damage or an outage. The mylar balloon incident at Dodger Stadium actually did occur, but it occurred a month earlier on July 31st. In fact, it was the power outage previous to the one I experienced.